If your business doesn’t have an app, you could be missing out on a lucrative opportunity. Apps can help you create a new revenue stream, market your business, and/or enhance business processes. Finding an app developer for your new app isn’t hard – the challenge is finding a developer who can help you achieve what you’re looking to do. Mobile app developers range in their background, experience and expertise, so you should have clear criteria for selection. Knowing what you want before you approach developers is also a good idea, as you’ll be able to ask them the right questions. 1. How will you ensure the app achieves my goal? 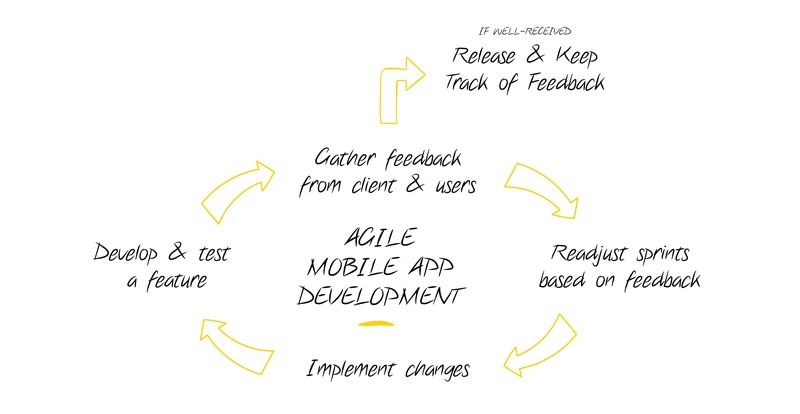 Before approaching a mobile web developer, be clear about what the app is being designed to achieve. Is it a new revenue stream for your business, to support your existing revenue streams, or some other purpose? An app that’s designed to generate a new revenue stream will be taking payments, encourage users to buy more, and helping deliver some sort of service or product. This means the app will look very different to other types of apps, and it might need extra security features and data-processing functions. An app that’s designed to market a product or business will be very different to one attempting to generate revenue in itself. If your app is to engage with users and/or promote awareness of your brand, make sure the developer clearly understands this goal. A suitable mobile app developer will understand if your aim is to develop an app that replaces or enhances an existing business process. They should be able to understand the business processes in question, so they have a foundation for building an app that can effectively replace or support the process in some way. This type of app, which is likely designed for internal use by staff in your organisation, will again look very different to other types of apps. The app developer should have an idea as to how it can be optimised for functioning and use in real-life. For example, if you’re a logistic company commissioning an app to help on-field sales personnel track customers on their tablets, you might decide voice recording or voice-text tools will let your sales agents take notes more quickly on the road. 2. Is my vision achievable? You should be clear on what you’re trying to achieve as an overarching goal, as well as the metrics you’ll be using to measure the success of your app development project before you approach a prospective mobile app developer. Finding the right developer will depend on them successfully relaying your vision and goals with confidence, into action. 3. How will you test and optimise? Testing is integral to development as it allows the developer to identify errors for correction. Reputable app developers test the app throughout the development process. Optimisation is related to testing, though it’s slightly different. During optimisation, the developer might look at things like safety, security, upload time, and design shortcomings. The optimisation process identifies potential areas for improvement. You’ll probably also want to ask them about the type of ongoing maintenance and support they can provide. 4. What special features and tools can you add? Innovative and useful features can help attract the attention of users and make it easy for you to achieve what you need on the back end. Cutting-edge graphics, a management dashboard, web service connection, 3D gaming, and social media sharing are some examples of innovative and useful tools. Figure out what you’d like, and ask your developer if they have other suggestions. 5. What compliance standards will you work to? Along with the platform you’re developing for (iOS, Android, or other), the developer should be aware of any standards or rules that the App Store or Google Play (or other app store) impose for submitted apps. If the operating system or store rejects the app, you’ll have invested your money on an app that can’t be distributed or at the very least will need further development for compliance. Check that your app developer knows the guidelines and rules so you won’t end up wasting your time and money with a rejected app. 6. What are the integration and security options? Encryption and protection against data loss are essential for the risk of malicious attacks, especially if your app is to increase revenue stream or has access to customer information. Additionally, if you need integration, check with your app developer about back-end and front-end technologies for integrating your app with other systems. This could be your CRM, ERM, and/or a cloud-hosted platform. 7. Can I see examples of your work? Check out how their apps look and work by reviewing examples of the app developer’s previous work. Reputable developers are usually happy to provide you with a list of apps they’ve worked on. Looking at their successful development project gives you a better idea of the calibre of their work. 8. How do we keep in touch during the development process? The quality of your app relies on your input on design and functionality requirements, so have a regular timetable for checking in with your developer. Find out whether they prefer regular phone discussions, emails, Skype, or other options. Ask them how often you can expect updates, making sure they are regular enough to keep an active involvement and allows you to feel confident about the process of development. 9. Will I own the app? Usually the customer paying for the app will own the finished product, but some developers might have different terms and conditions. Ensure you will own all the rights to the app – everything from design and code to content – and make sure you sign a contract that specifies this. Budget will probably be a major consideration, but signing with the cheapest developer won’t necessarily yield the outcome you’re looking for. No matter what price is quoted, it’s likely you’ll be able to find someone willing to do it for you cheaper. The important thing is to balance budget with quality considerations, or you could end up regretting working with the cheapest developer. When choosing a developer, make sure they have a clear plan for how they’ll achieve your requirements. Ensure they can provide the special features you want and will work to applicable compliance requirements. By asking these questions of prospective developers, you can get a good idea of whether they can achieve your vision for the app. EB Pearls is Australia’s most trusted digital agency, providing innovative and profitable websites and apps for our happy customers for more than a decade. To find out more about how our mobile app, web design, and ecommerce expertise can help drive your business to the next level, explore our services or contact us for a discussion today.